and he recites another rhyme. Where is the Green Sheep? is a long time favourite and it is great to see another book by this author/illustrator combination. Mem Fox is always a joy to read aloud and Good Night, Sleep Tight is especially fun with its changing rhythm and pace - from the text of the main story, to the nursery rhymes and back to Bonnie, Ben and Skinny Doug. The illustrations by Judy Horacek are bright and energetic. She blends beautifully the world of Bonnie and Ben with the action of the nursery rhymes by involving the children in the rhyming worlds. Bonnie’s stuffed horse becomes their steed in This is the Way the Ladies Ride, and the children, along with their babysitter, ride into the picture at the end of the line of ‘ladies, gentlemen and farmers’. 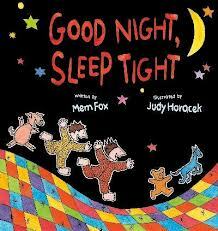 Horacek also manages to balance the lively illustrations and characters with the bedtime atmosphere. Good Night, Sleep Tight has great rhyme, rhythm and repetition. Young children will find familiarity in the seven classic nursery rhymes such as Good Night, Sleep Tight, Pat-a-Cake and It’s Raining, It’s Pouring, as recited by Skinny Doug. The characters are fun and engaging and the message, of stories before sleep, is beautifully and simply portrayed. It makes a wonderful bedtime story for the under fives.